DAMIEN Campbell had head surgery before being adopted as a baby. But until he had a child of his own, he didn’t know exactly why. His son, Dylan, 20 months, is recovering from a major operation to repair his skull. Like his dad, as later became apparent, Dylan was born with a rare condition called sagittal synostosis, the premature fusion of the the skull in babies and toddlers. In the Campbells’ case, this meant the head had a tendency to grow lengthways, rather than in a rounder shape. “I knew something wasn’t right with my head, but I haven’t got a history of my medical condition,” Mr Campbell said. Mr Campbell had corrective surgery on his skull, but was teased at school because some abnormalities remained. His wife, Helen, said that was part of the motivation for Dylan’s surgery. “Damien went back to how he was at high school, and how everyone looked at his head, and he didn’t want our son to be picked on,” Mrs Campbell said. But more important than cosmetics was the potential for neurological damage, if the misshapen skull put pressure on the brain. “We had to weigh up the benefits of having it done,” Mr Campbell said. Fortunately, those hands belonged to Dr David Chong and a team of specialists at the Royal Children’s Hospital. The team leads the world in the treatment of this condition, pioneering what has become known as the Melbourne procedure. Over the past decade, about 90 toddlers have been operated on. Dylan had surgery in September, shortly before his first birthday, and has made a surprisingly quick recovery. “Our aim is for them to look like normal kids, and be normal kids,” Dr Chong said. The operation involves pulling back the scalp and reshaping the skull. AS Isaac Jones blows out the candle on his first birthday cake with a beaming smile, it’s almost impossible to believe he lay in an operating theatre with no skull and his brain fully exposed just three days earlier. He turned one this week, but tiny Isaac Jones is already the pin-up boy for extraordinary brain surgery developed here. Looking at his perfectly shaped head, it is even harder to believe that until Tuesday the energetic Shepparton baby had a severely deformed skull which was squeezing his brain and would have caused him endless problems in life. But as the bandages were removed from Isaac’s still- swollen head yesterday – coincidentally his first birthday – the full extent of the miracle worked by the Royal Children’s Hospital’s cranio-facial surgeons was clear. Isaac’s overjoyed dad Troy said: “They have given him the opportunity for a great start in life … a normal start in life which every kid deserves.” As well as giving children with deformed skulls a chance at normality, the ground-breaking operation invented by Prof Tony Holmes put the hospital on the map – and is now performed globally as the “Melbourne Procedure”. The modest pioneer of the radical skull-shaping technique describes it as “nothing more than advanced carpentry”. In many ways it is more like a human jigsaw than the most amazing and delicate mix of brain surgery and plastic surgery. After decades of less-than-ideal operations, the Melbourne Procedure is bringing new hope to families of children like Isaac who suffer from scaphocephaly – derived from the Greek for “little boat”, and translated in this context as the appropriate but cruel “boat-shaped head”. The condition sees fusions between the bones at the top of a baby’s skull not allow the bones to grow, meaning the head cannot expand sideways and is instead forced to grow longer at the front and back to accommodate the growing brain. IN Isaac’s case the condition was profound and left him with a dramatically long and thin head. But it was the probable damage to Isaac’s speech, motor skills and intellectual development that convinced parents Lisa and Troy to go ahead with the most radical reconstructive surgery. It was the same concerns a decade earlier which sent Prof Holmes to the drawing board to develop a better operation. Initially, doctors tried to cut the problematic fusions out. But this proved useless as the skull would repair itself quickly with the same fusion issues. They then began removing a large section of bone behind the children’s forehead and literally pushing the rear of their head forward, making their head shorter and squeezing their brain even more. Instead, Prof Holmes pioneered a new operation in which the removed piece of skull is replaced at the rear, lifting the top of the skull up while allowing the sides to grow, which has since been refined to produce a perfect skull. “We realised for the first time the pressure was not just a cosmetic issue. The restriction on the brain does cause developmental delays and releasing that pressure would seem to improve them,” Prof Holmes said. “We have now been doing this for 10 years and the results have been good. “We have not had to re-operate on any children, there have been none with brain pressure, and all of them are growing normally. RECENTLY, leading craniofacial surgeons from the US and Canada came to the Royal Children’s to learn the technique and take it back home to teach their colleagues – while the Melbourne team is learning to treat other skull conditions in the same way. The surgeons have also begun to monitor the development and emotions of patients to better understand their outcomes for the first time. In the Royal Children’s operating theatre No.1 on Tuesday the importance of the operation was dramatically visible. As the malformed bones of Isaac’s skull were drilled, sawn and then removed from his head, his brain could be seen instantly swelling at the sides, contracting at the rear and assuming the shape it was always intended to be. “It’s as though the brain breathes a sigh of relief, even though brains don’t breathe,” an anaesthetist said. On a trolley next to the operating table, Isaac’s skull — now cut into seven pieces — was cut, cracked, shaped and moulded into its new shape by Dr David Chong, one of two Royal Children’s surgeons Prof Holmes has trained to continue his work. In its new order the former top of Isaac’s skull with its troublesome fusion becomes the back, while the elongated rear with its “bullet point” that stuck out becomes his crown. Isaac’s all-too-prominent forehead had slits cut into it so it could then be flattened and reattached with the use of dissolvable rivets and reinforcing. The technique is possible because the young bones are still relatively soft and pliable — to the extent it will take less than two days for new bone to grow in the gaps between the jigsaw to completely join Isaac’s beautiful new head. Despite the brutality of the procedure, Isaac was ready to have the bandages removed just three days later. He will travel home early next week without even having to wear a helmet or be wrapped in cotton wool. But knowing all that he has been through and the efforts of the surgeons, mum Lisa will be taking every care regardless. “Knowing he was going to have the best hands in the world looking after him, with Tony on board and David doing the surgery, all that put us at ease that everything will be OK,” she said. FOR the first year of his life, Zakariya Elmoustafa’s tiny brain fought to keep developing inside a skull that had stopped growing. It was the most severe case of a fused skull ever seen by Victorian doctors, robbing the toddler of even the basic abilities of being able to smile or look his father Ibrahim Elmoustafa and mother Ahlam Elakkoumi in the eyes. 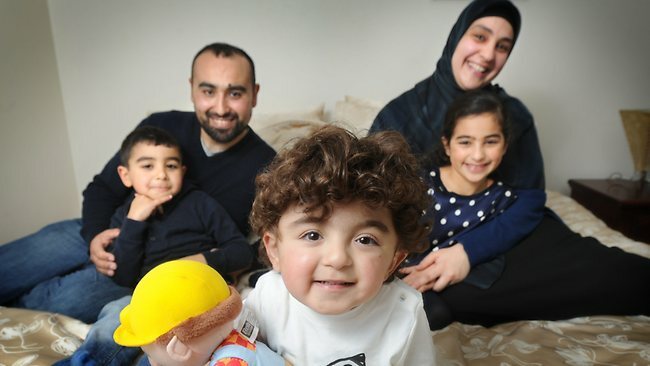 But a series of radical surgeries at the Royal Children’s Hospital to prise open his skull have not only saved Zakariya’s life, they have allowed him to interact with his world for the first time. “The hardest thing was seeing people take a second or third glance at him,” said Ms Elakkoumi. “As a parent you want to protect your children from anything, so I’ve just had to hold him much closer. But now he’s free to live life.” Zakariya, now aged two, was born with an unusually shaped head – a rare syndrome called pancraniosynostosis – seen no more than twice a decade in Victoria. A newborn’s skull is made of separate bones, allowing it to fit through the birth canal and accommodate the rapidly growing brain in the first two years of life.But the plates in Zakariya’s skull were fused together at birth, leaving the back of his skull so flat that it was constricting his growing brain. Neurosurgeon Alison Wray and plastic surgeon David Chong took on the case, a unique combination of craniofacial skills that has also seen them involved in the separation of conjoined twins Trishna and Krishna. “It was the most severe case I’d ever seen,” Ms Wray said “We weren’t able to engage with him. He wouldn’t look at you and it didn’t appear like he was seeing and interacting with his world.” But before his constricted brain could be relieved, Zakariya needed open-heart surgery at two months to ensure his heart could pump blood effectively.Once he was medically stable and could tolerate anaesthetic, surgeons scoured the world for techniques they could borrow to buy them time. They needed to increase the size of his skull quickly while waiting for his heart to strengthen so he could survive more complex surgery. At age six months, four tension-loaded springs were inserted into bone across the crown of his head. They opened gradually on their own over two months to increase his head circumference. And the results were instant. Two days after surgery Zakariya – for the first time in his life – smiled at his parents and was able to focus and follow objects. But the bigger operation was to follow, when the 12-month-old had four “distractors” screwed across bones in his skull.